St. Petersburg is one of the most famous, historic and beautiful cities in the world. It is also a thriving modern metropolis undergoing a renaissance. What better idea than to enjoy our favourite sport here? Apparently the Romanovs did. Peter I is said to have been at the forefront of the sport at that time – which was the early 1700’s so we are not sure how accurate this report is. We found some photos of Tsar Nicholas II rowing – but not quite the style of boats that we like. Perhaps this is a bit like St. Petersburg itself, rather mysterious, raising more questions the more you explore, not quite what you expect. The sheer grandeur of the city is just as advertised and will not disappoint. Palaces, gilded steeples, monumental art, colourful facades lining canals. It just goes on and on and on. Absolutely iconic, spectacular, bucket list. And to further enhance your St. Petersburg rowing tour, we propose an optional extension for a couple of days of rowing in rural Russia – very different but equally beautiful and just as fascinating. A brilliant contrast. Water, water everywhere. Originally a marshland at the edge of the Baltic Sea, St. Petersburg was created by imperial decree of Peter the Great in 1703. It became his warm water port and “window to Europe”. Inspired by Amsterdam, swamps were drained, marshes filled in, canals created and ultimately 342 bridges were built within the city limits. 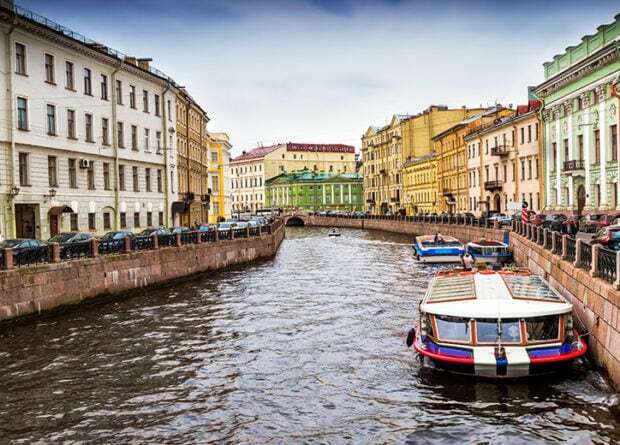 We will row the rivers and canals of the city over four days, as well as two optional days rowing the Volhov River as it flows towards Lake Ladoga, which then flows into the Neva and back to St. Petersburg. 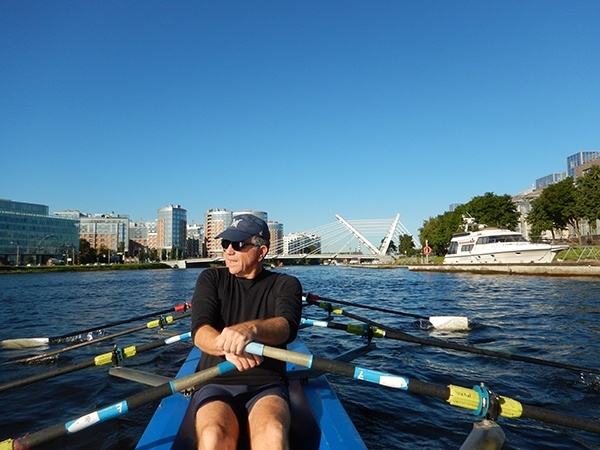 Our base is the English Rowing Club, a powerhouse of Russian rowing, but a club that appreciates the beauty of where they row, and Andrej will show us his favourite spots. This is a city best seen from the water. 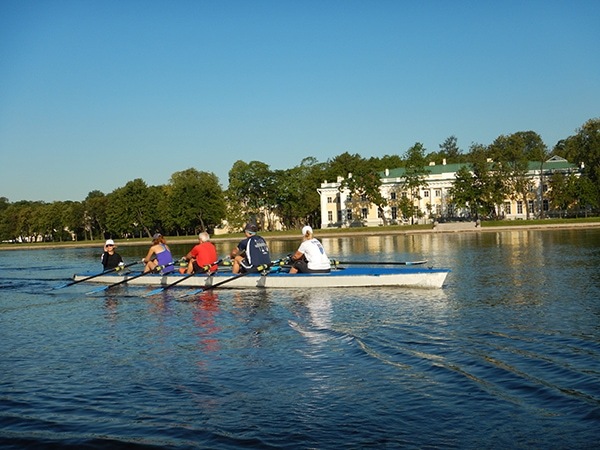 Our priority is to experience St. Petersburg through rowing. In the afternoons, we will experience the culture of this magnificent city and its surroundings. Anna, our guide and translator will take us to some of the most significant sights: the Winter Palace and the Hermitage, Peterhof, Church of the Saviour on the Blood. She will also share some of her personal favourites, especially when it comes to lunch and dinner. Look carefully, every day she will wear a different set of earrings and necklace in the Fabergé style. But culture is found at the rowing club, whose honourary chairman is Sir Steven Redgrave. We will get a tour of the historic clubhouse including the Museum of British Rowing and a Museum of Russian Rowing. All this culture and rowing makes one hungry. We will dine at some of the best restaurants in the city and also take you to a “canteen” where the locals eat. 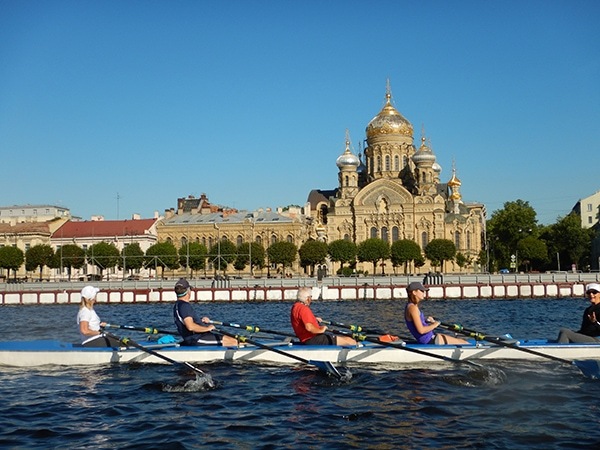 This is a once-in-a-lifetime, must experience St. Petersburg rowing tour. We look forward to sharing it with you. Please contact us for single supplement pricing. Non-rowers are welcome on this trip – please contact us for details and pricing. 15—25 km per day. Coxed coastal quads. Maximum 20 rowers. Minimum 10 rowers. Important note about the rowing: This is one of our more challenging rowing trips. 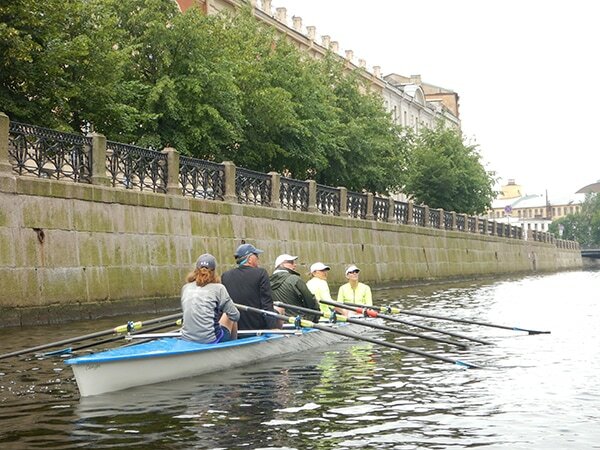 While we often row on calm and flat water in the canals of St. Petersburg, we also row on the main stem of the Neva River as well as venturing briefly onto the Gulf of Finland. There are strong currents and big waves. We row coastal boats, which are best suited to handling wind, irregular waves and current. Participants must be experienced and strong rowers who are calm and confident with rough conditions. Coastal rowing experience is an asset, along with coxing skills. We take turns coxing, and at times must navigate through boat traffic and narrow canals. Please also note that we use public transportation to get to and from the club, which requires walking. Five nights accommodation in an excellent central hotel in St. Petersburg. One night in a forest cabin and one night at a hotel near the airport for the add-on. All breakfasts, 4 lunches and 4 dinners in St. Petersburg. All meals during the add-on, including a BBQ at a country dacha. Guide services and tour support. Tour leader is Anna Grishina. Rowing guide in Andrej Miller. Private departure dates available – please contact us for details. Note that is itinerary is subject to change, due to many factors including weather and water conditions for the rowing. Arrival in St. Petersburg. Stroll past the Winter Palace for our welcome dinner at an excellent restaurant named after one of the city’s many famous writers. Let’s get rowing! We head to our base at the English Rowing Club for a first row. We will explore the islands immediately around the club, then head for two of the most dramatic and modern bridges in St. Petersburg. Out we go into the Gulf of Finland! But is it freshwater or saltwater? An exhilarating introduction to rowing in Russia. For the afternoon, we board a bus for a guided city tour. With various stops along the way, some famous, some quirky, we get an excellent overview of St. Petersburg, its history and modern day life. With an early morning departure we join the Neva River and row down past some of the most famous vistas. We pass the Winter Palace, emblem of imperial Russia and the cruiser Aurora, which played an important role in the start of the Russian Revolution in 1917. We row along canals lined by colourful palaces in the Italian style, glimpsing golden church domes and vast squares. And of course passing under many beautiful bridges. In the afternoon, Anna will take us through the vast and spectacular collections of The Hermitage, showing us her personal favourites. Our third row further explores the canals and waterways in the vicinity of the English Rowing Club. All this rowing is working up an appetite. When we row the boats home to the English Rowing Club, waiting for us is a traditional lunch, prepared by the club’s cook. She cooks for the national team, so there will be lots of very, very good food. Before we might be tempted to nap, Svetlana will guide us through the history and museums of the club, giving us lots of insights into the traditions and culture of rowing. A bit of a relaxing afternoon before a visit to the Church of the Saviour on the Blood. This is another iconic and historic building, and one that graces the cover of many guidebooks. We will learn the reason for the unusual name as well as appreciating the architectural charms and details. Dinner on your own tonight. This morning we enjoy our last row from English Rowing Club. And what a row to finish off! 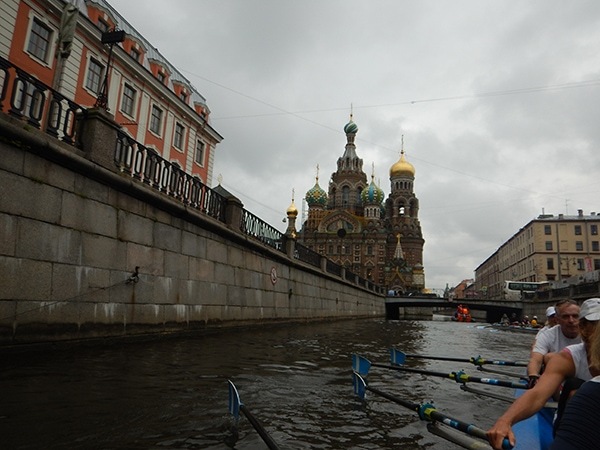 Crossing the Neva, we enter the Griboyedov Channel to row right underneath the magnificent Church of the Saviour on the Blood. Then along the Fontanka River, rowing past our hotel, then back to the Neva near the Winter Palace. We said it – the views of this city are best from the water. Our afternoon visit is also a highlight – a guided tour of Peterhof, or the summer palace, outside of city. We will skip the crowds inside the building and get a special tour of the remarkable waterworks that support the hundreds of fountains in the magnificent gardens. Returning to the city, it is time for a final dinner in St. Petersburg. Today may be departure for some, but we hope that most of you will also enjoy our country rowing add-on. With this tour extension, you will have experienced the diversity and contrasts of modern Russia. We leave St. Petersburg this morning heading towards the Volhov River. We will break up the journey with a visit to Staray Ladoga, the old fortress built in the 15th and 16th centuries on the shores of Lake Ladoga. There is a delightful wooden church inside the fortress, perhaps overshadowed by the beautiful 12th century church of St. George with its magnificent frescos. After a fortifying lunch, we will explore the Volhov River. Our accommodation tonight is by the shores of the lake, in a forest – you will stay in cozy wooden cottages. We will row as long as we want before packing up and loading the boats on the trailer. On our way back we may stop at a new museum presenting the seige of Leningrad during WW II. But we will be sure to arrive in plenty of time to enjoy our farewell BBQ at Anna’s cottage or dacha. You can snooze on the bus back to the edge of the city, where we will overnight in a hotel near the airport – perfect for those early morning departures. A fond farewell and departure from this spectacular, dazzling city. 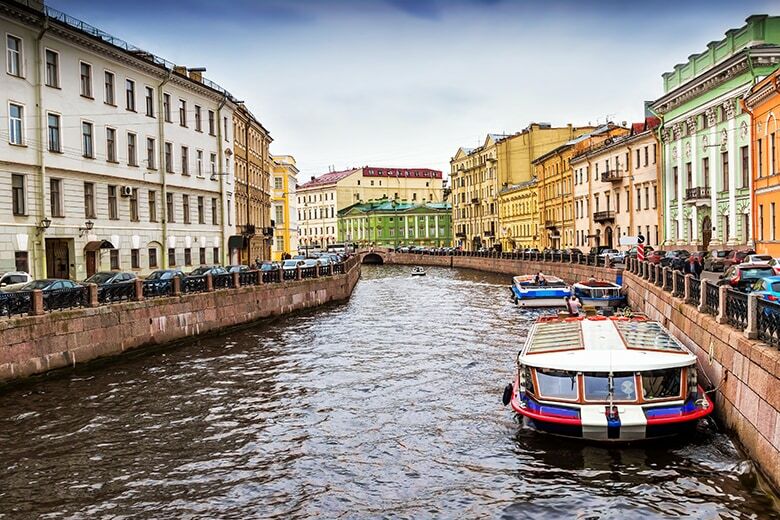 Cross St. Petersburg rowing tour off your bucket list.